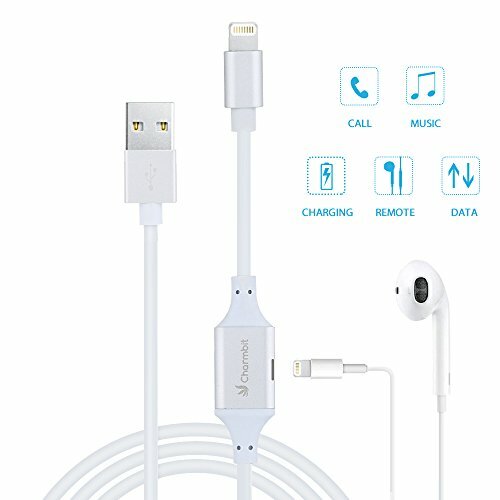 CHARGE & MUSIC : iPhone splitter designed for iPhone 7 / 7 Plus/ 8 / 8 Plus/ X, it allows to use Lightning headphone and charge at the same time. SUPPORT PHONE CALL: It supports volume adjustment & up and down control on the headset board ,music off to call when ring and back to music after call automatically. EXTRA DURABLE CABLE: Replace your 3ft / 0.9m lightning cable or add another one for home, work or travel.Strength and flexibility ensuring long-lasting performance. FASTER CHARGING & DATA SYNC:High-quality copper wire maximizes signal quality and increases durability. Sync and charge at fast speeds on your lightning devices. EXCELLENT SOUND PERFORMANCE: Supports up to 48 KHz and 24-bit audio output,keep apple lightning earphones sound quality with no compromise. Great 2 in 1 cord!!! Fast Charge, great audio output, perfect 2 in 1 Cord!